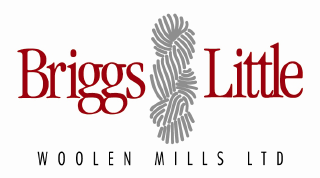 Tour – Wool Knitting Yarn from Briggs & Little Mill Ltd. 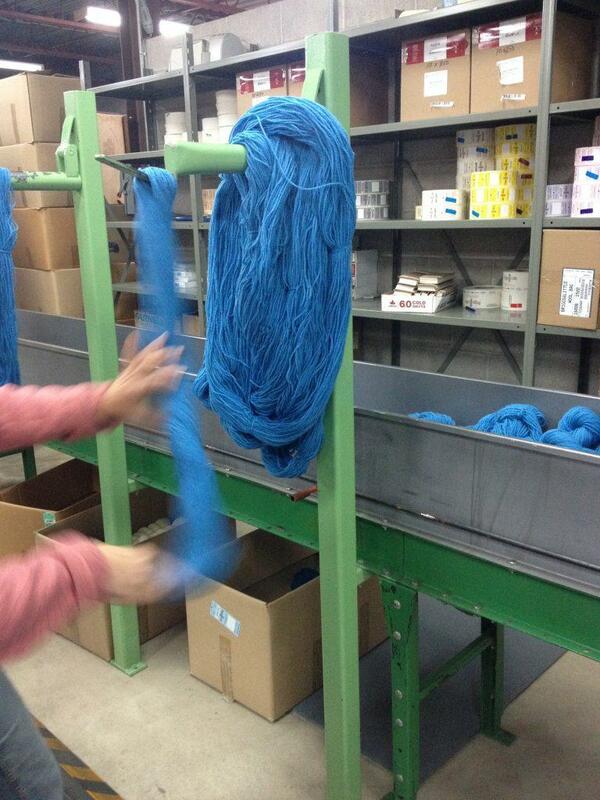 This is the beginning of our manufacturing process. 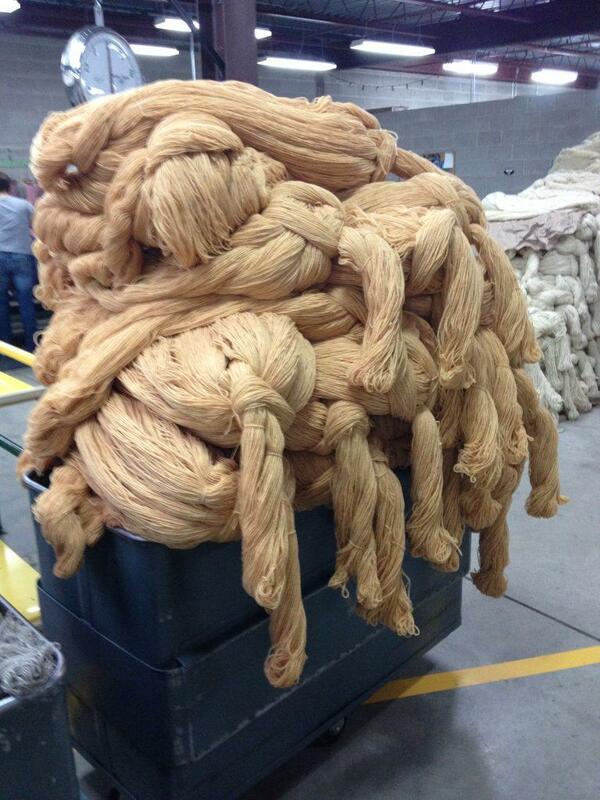 We first must wash the wool. 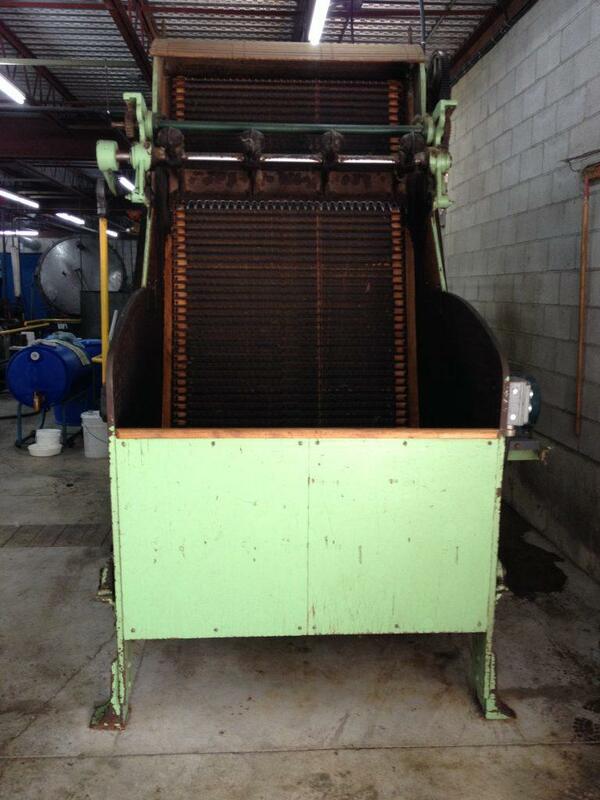 This will remove the oils, dirt, and manure. 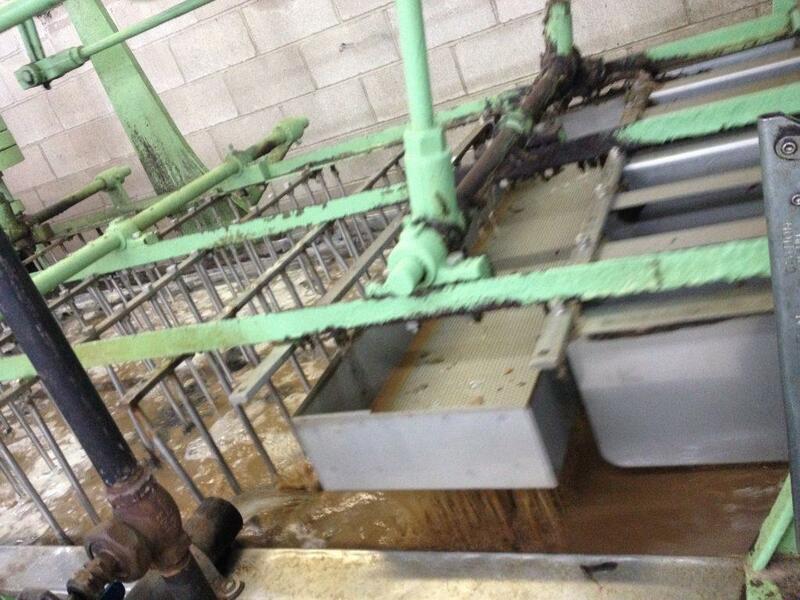 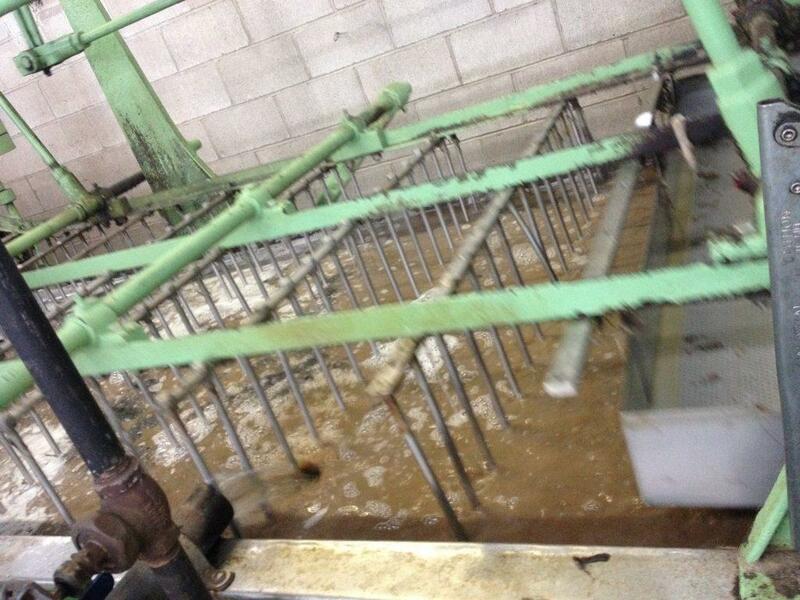 We cannot wash out vegetable matter, but have to machine it out later. 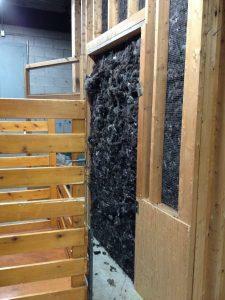 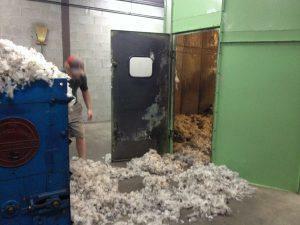 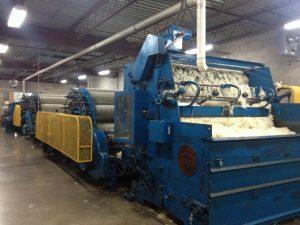 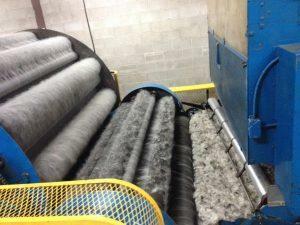 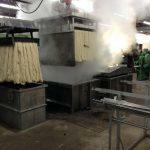 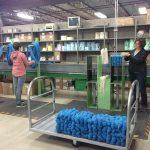 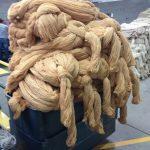 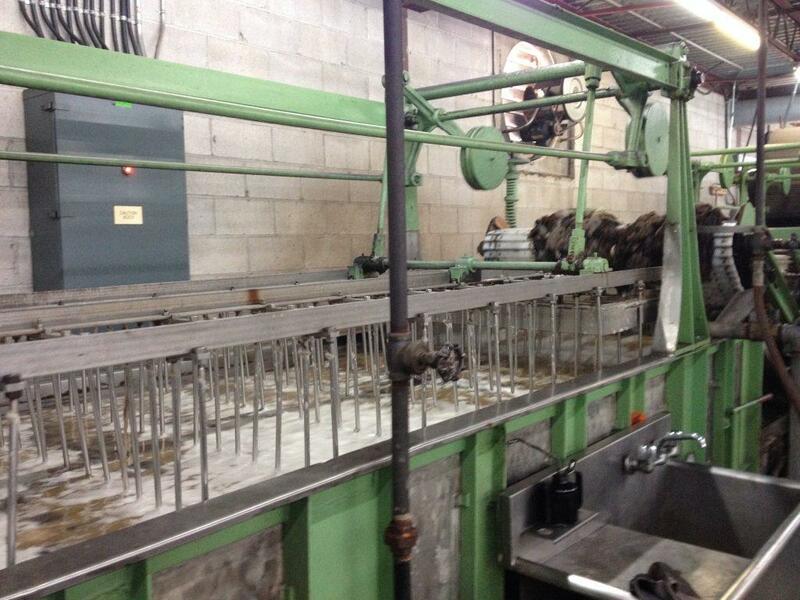 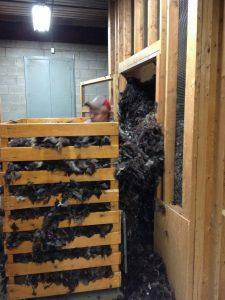 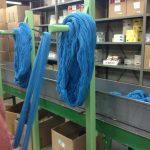 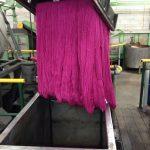 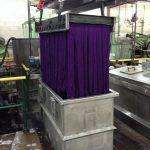 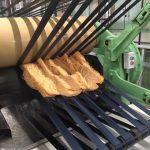 All grease wool must be scoured, so we can dye it or machine it. 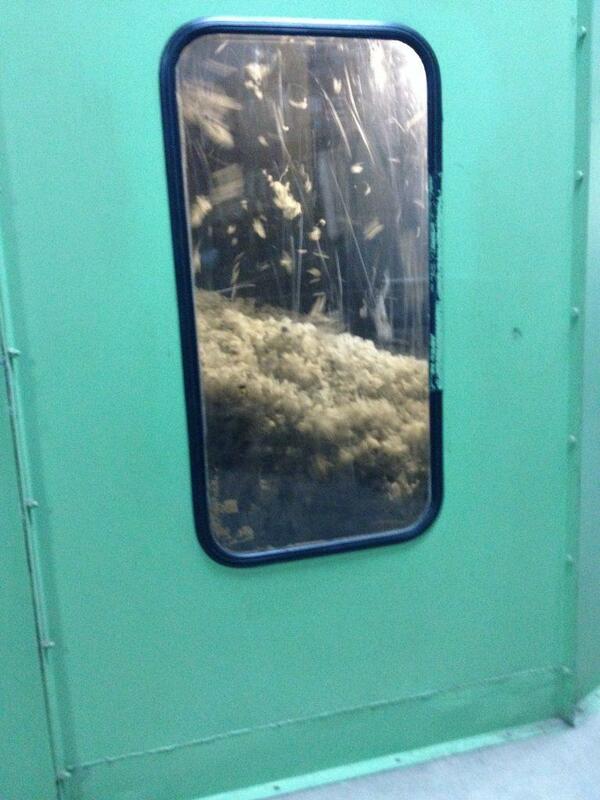 From there it is blown upstairs through a series of pipes into the correct bin in the picker room. 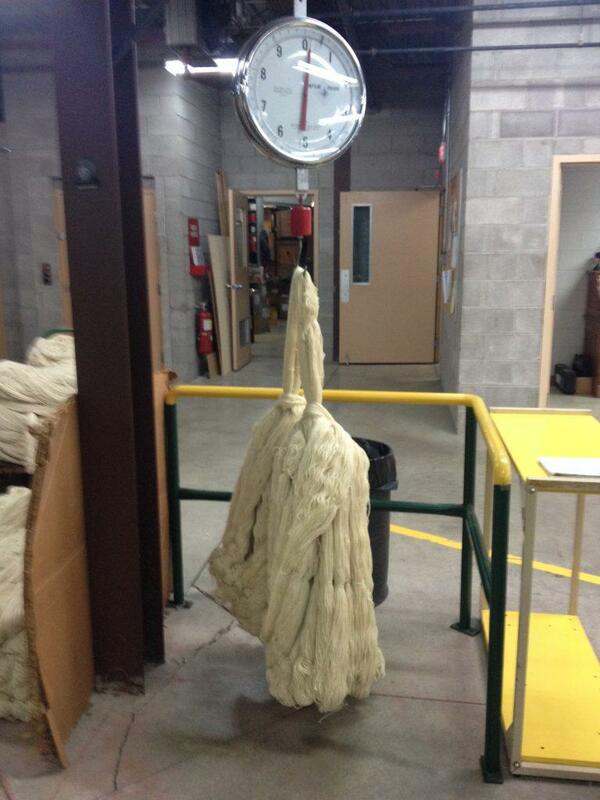 From there it is weighed into a recipe for one of our many blended shades or picked as a straight color to be blown through another pipe to the bin for carding. The pickering process. 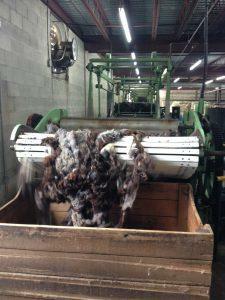 From here the wool is blown through a tube into a bin to be ready to be put through the cards. 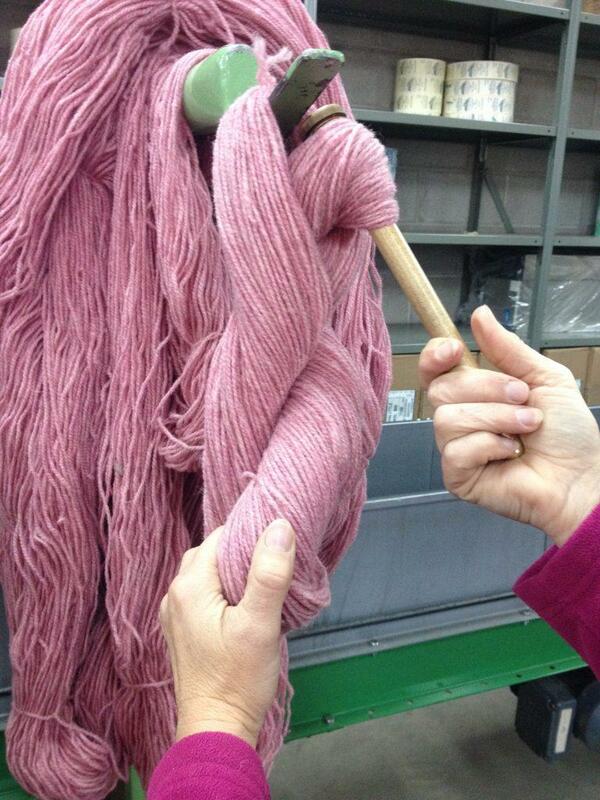 Weighing up the wool to be spread out on the floor for a specific recipe to manufacture one of our blended colours. 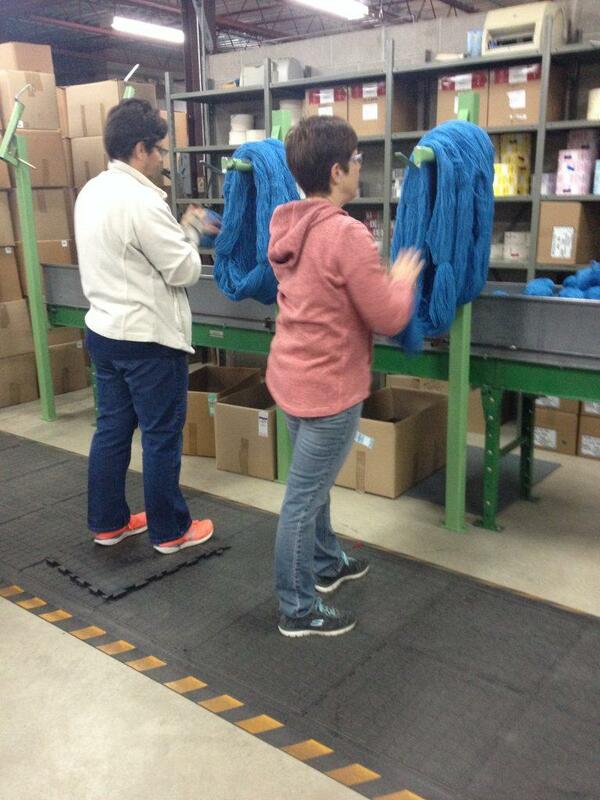 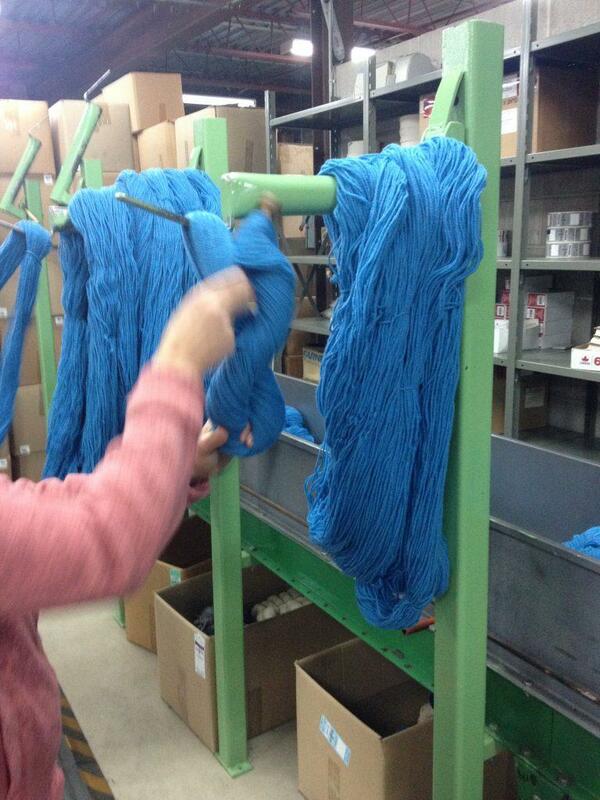 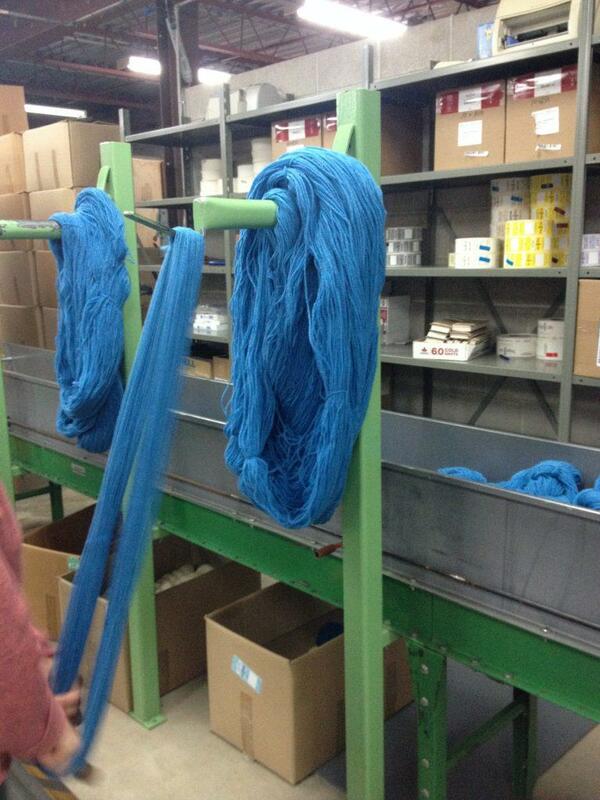 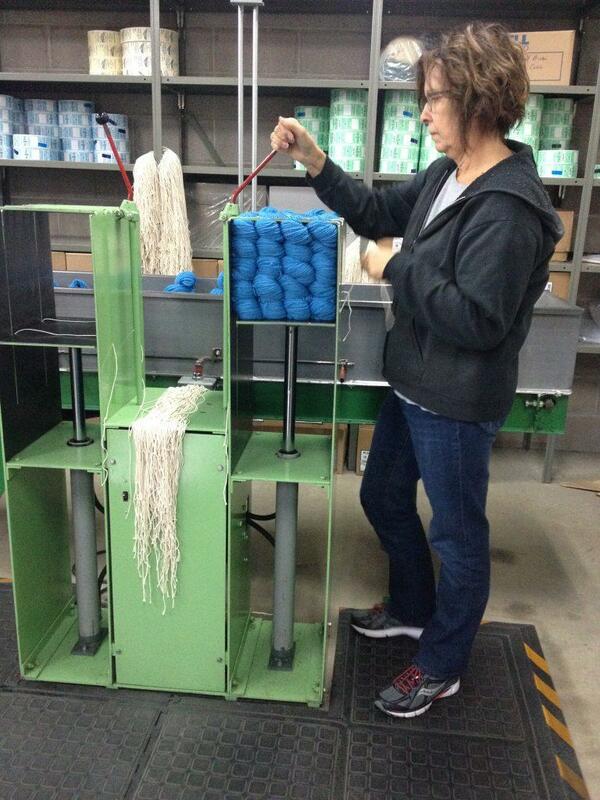 With picker in back ground, the recipe for one of our blended nylon shades is ready to be put through the picker. 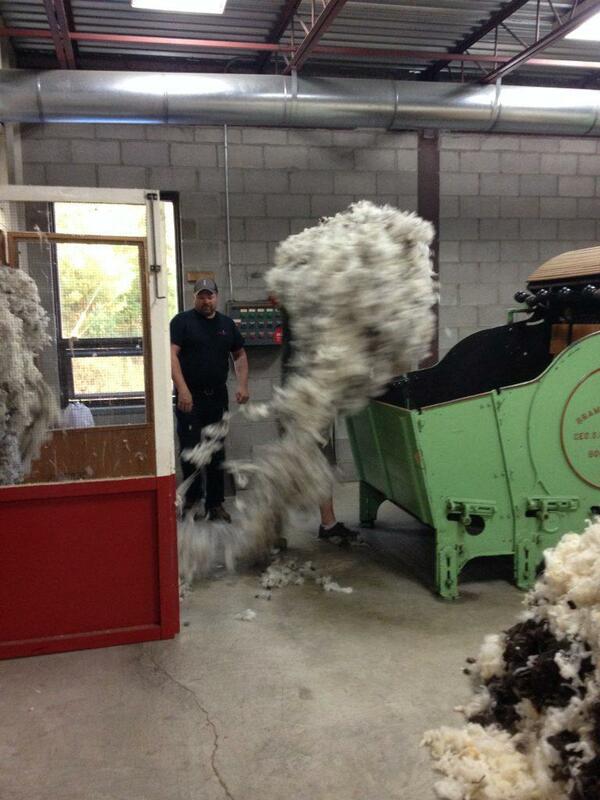 Wool being put through the picker. 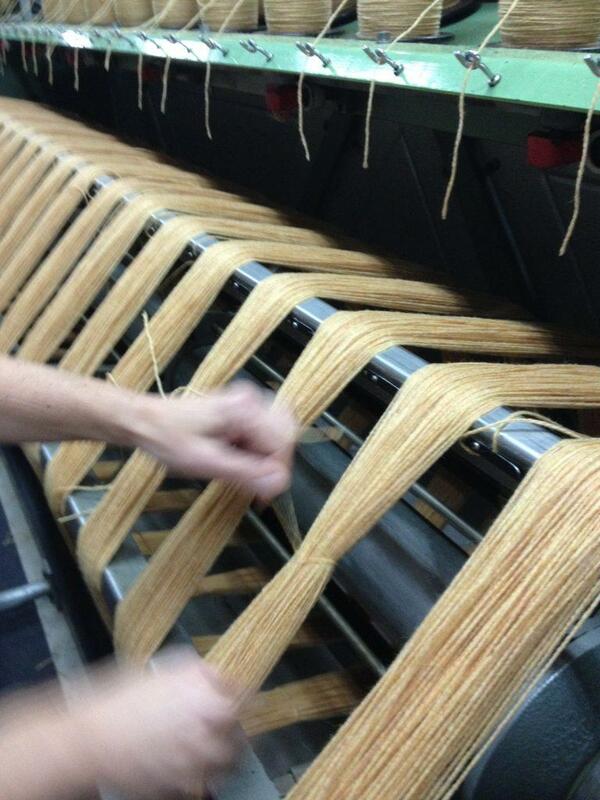 Blending the shades through the picker. 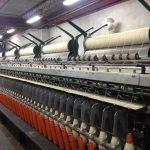 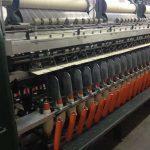 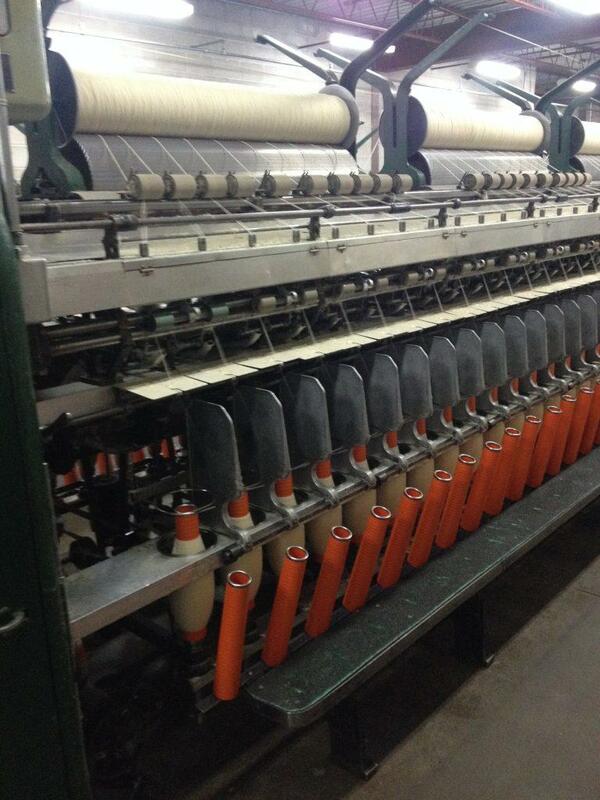 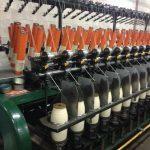 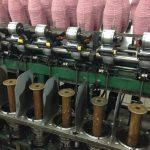 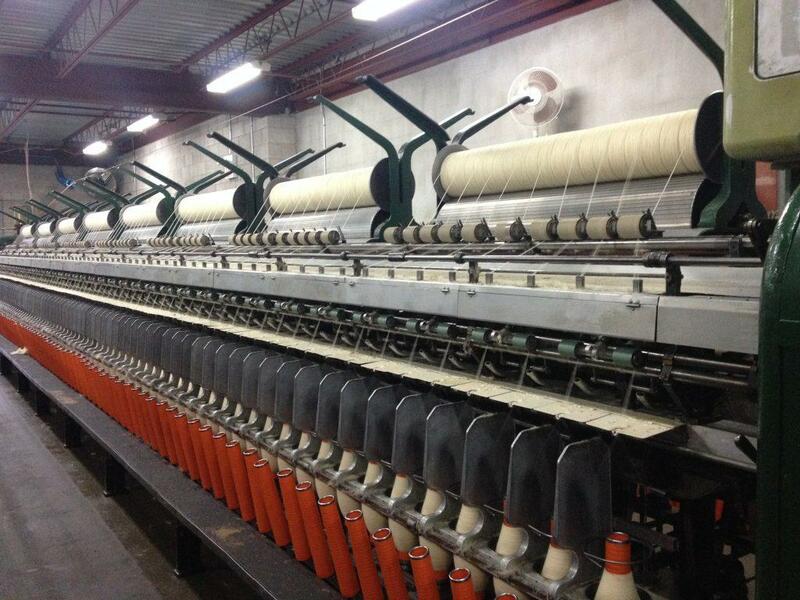 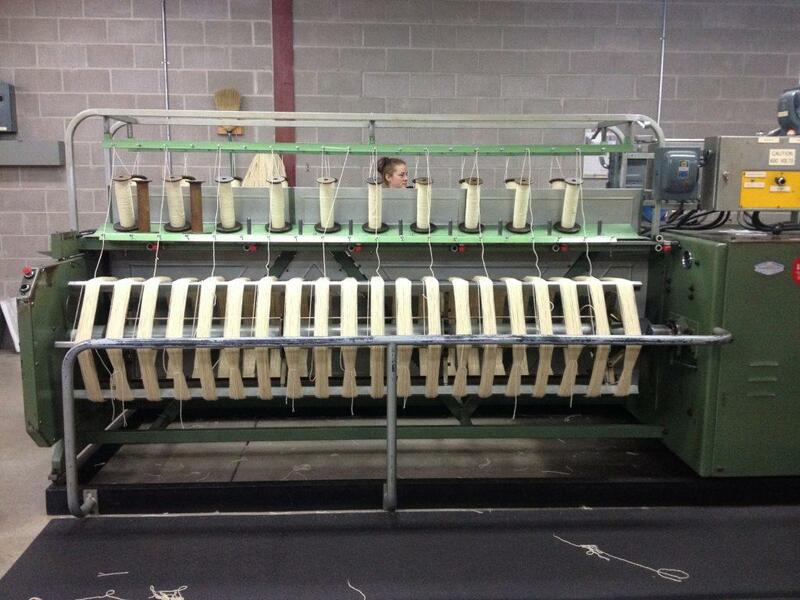 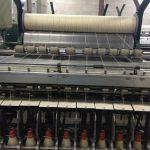 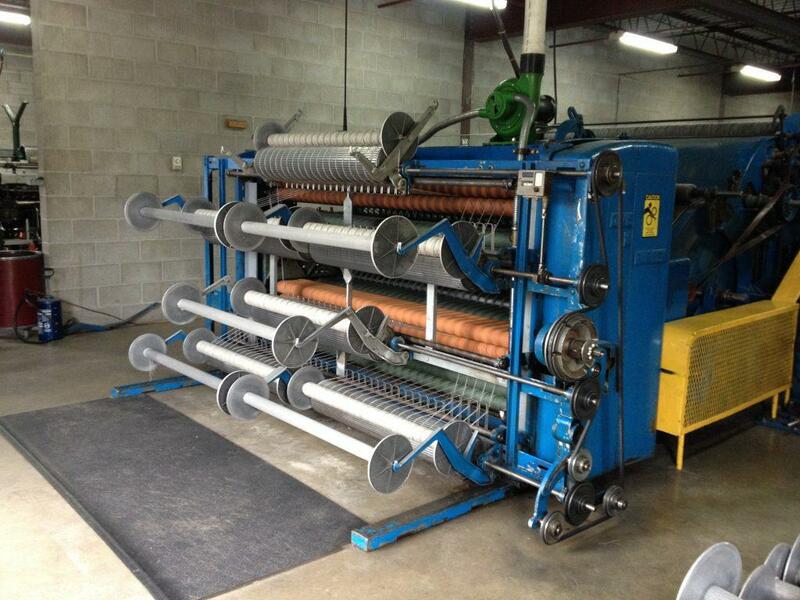 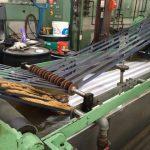 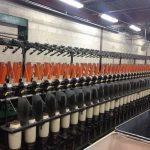 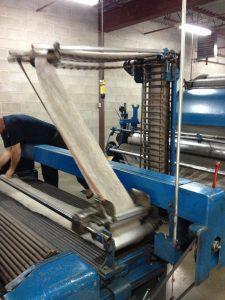 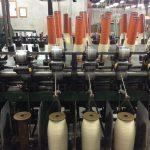 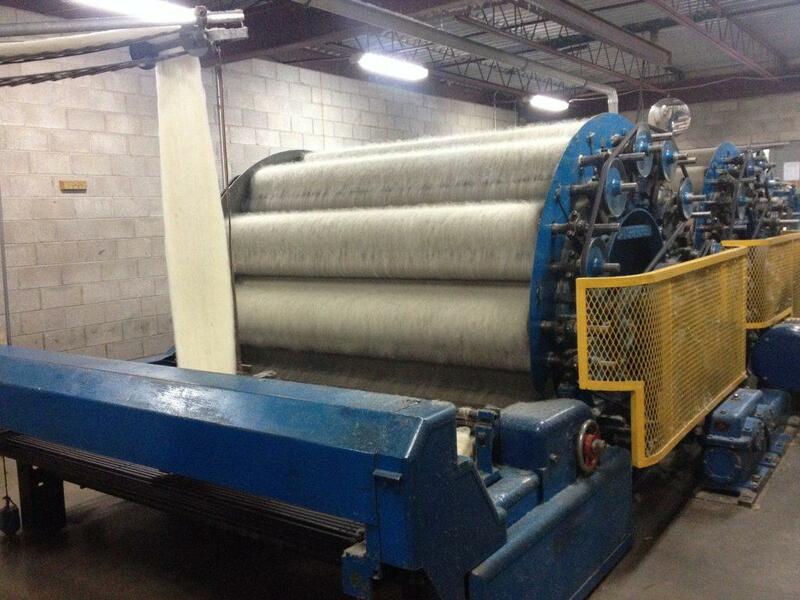 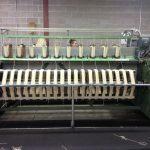 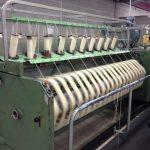 Carding is the most important machine in any textile operation. 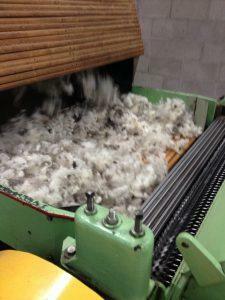 Loading up the hopper of the carding machine with wool. 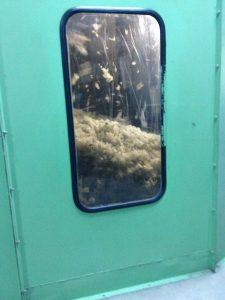 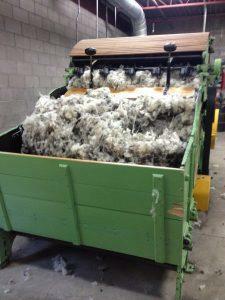 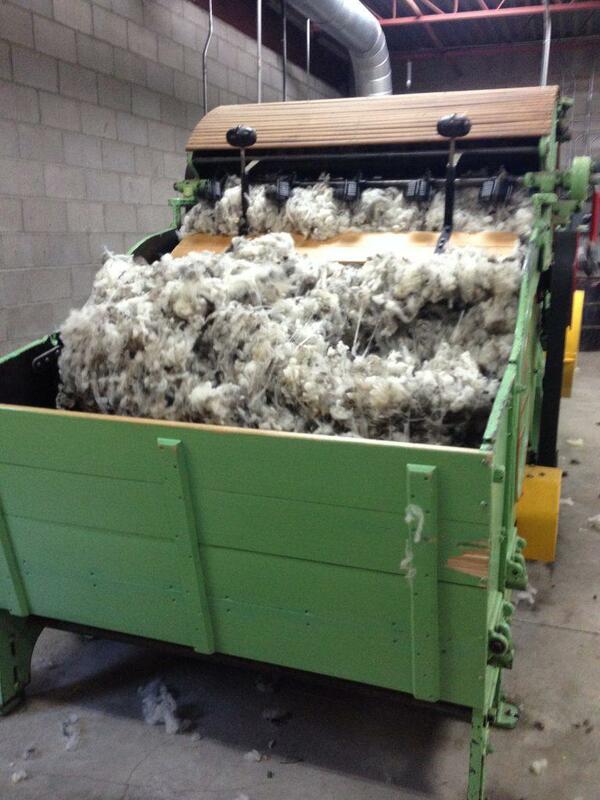 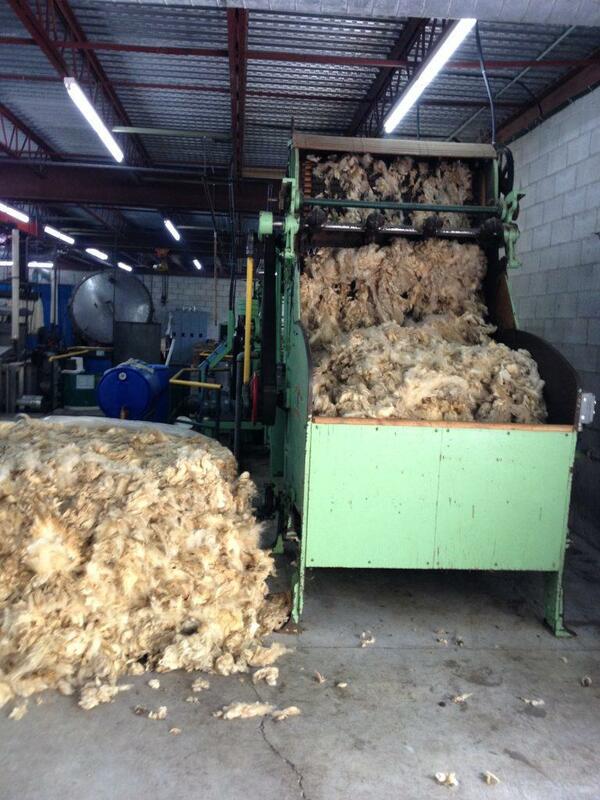 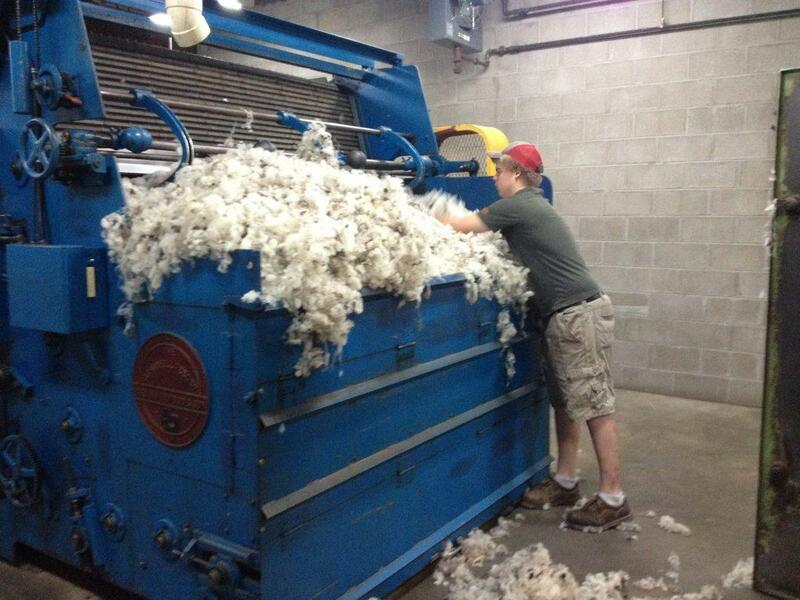 Hopper full of wool going through the carding process. 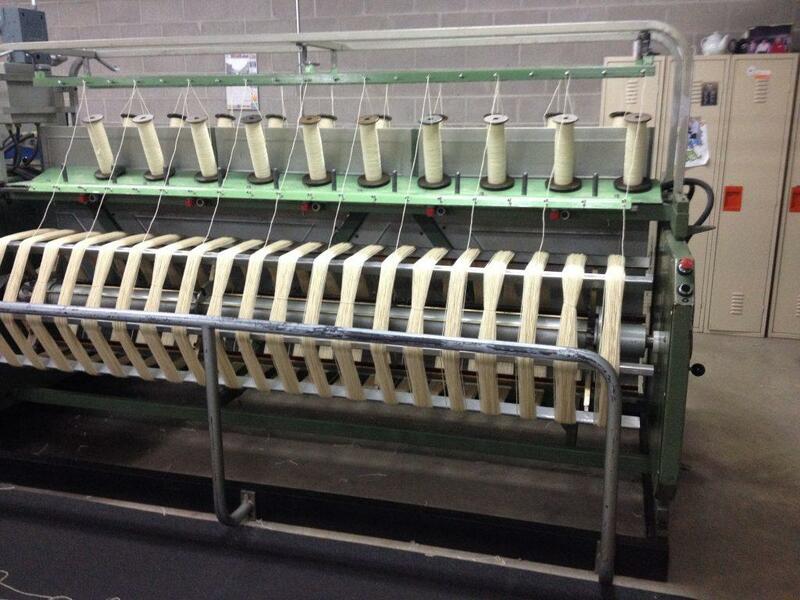 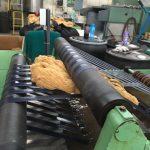 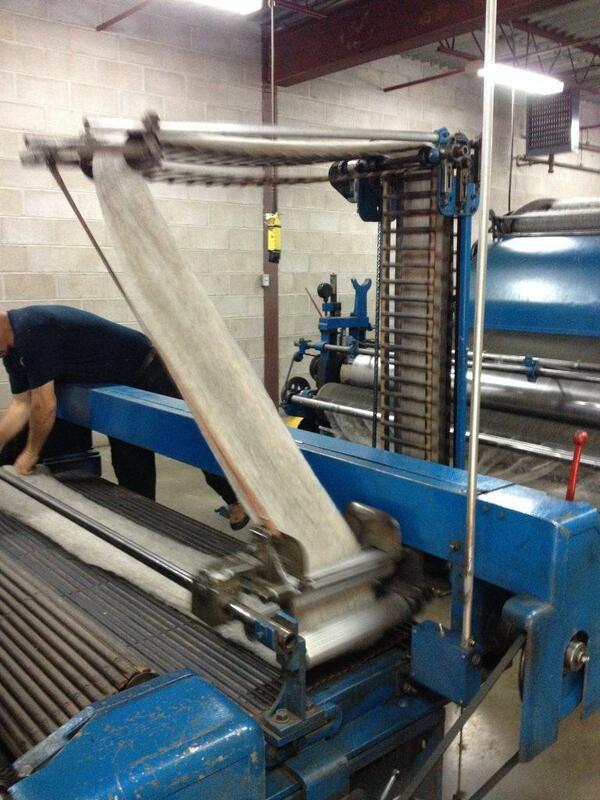 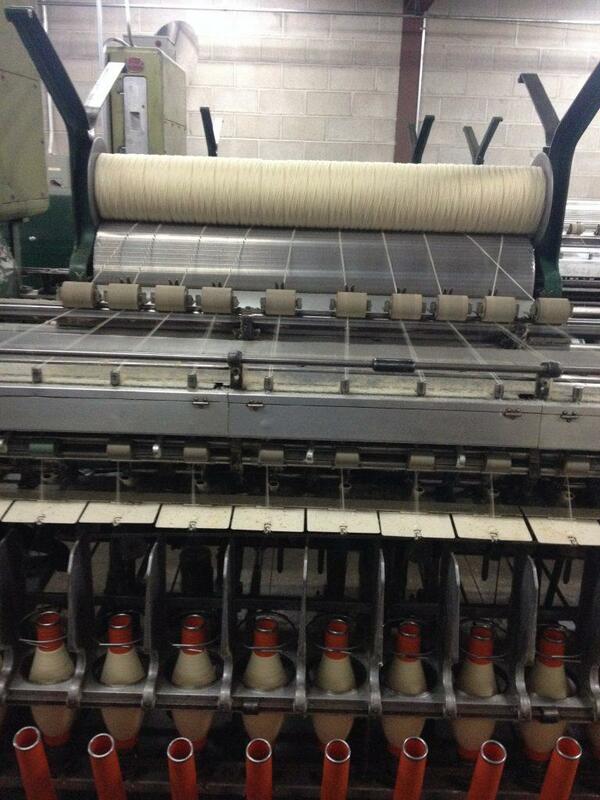 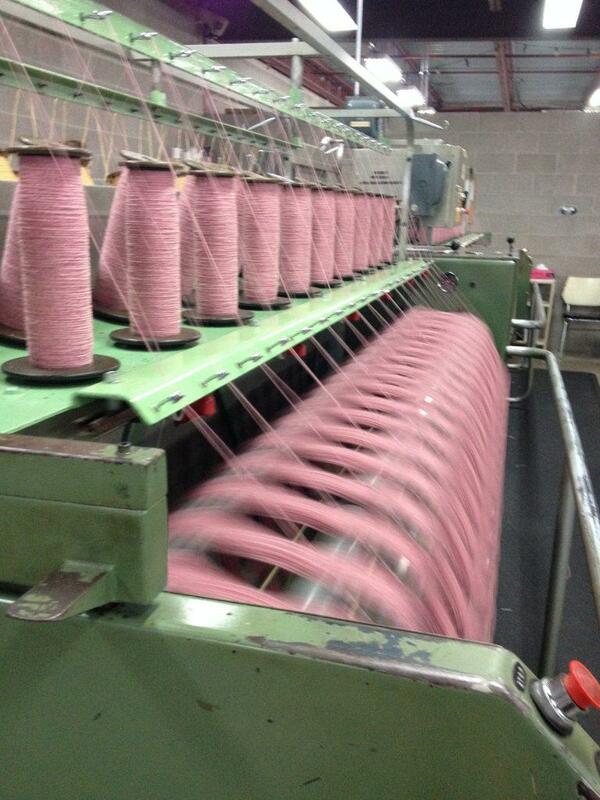 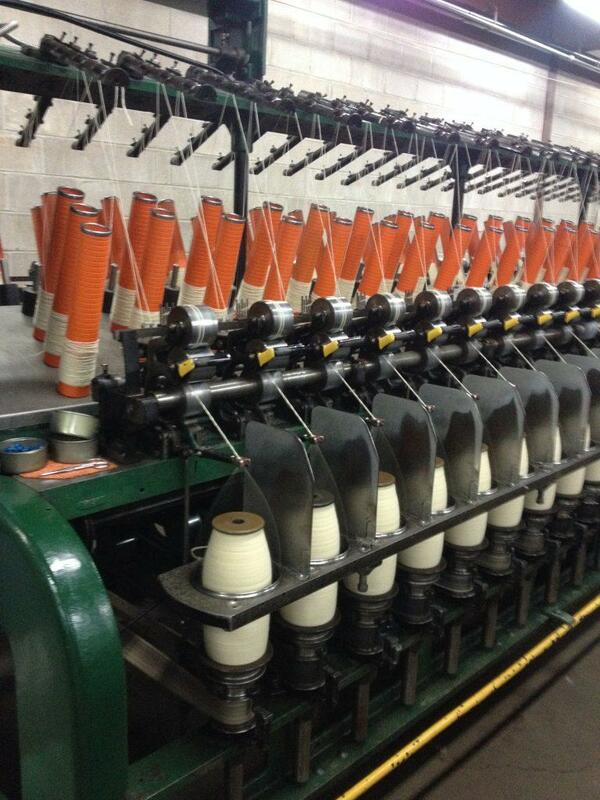 Here the wool goes through a series of rollers of card clothing (rollers covered in tiny wires) to remove clumps. 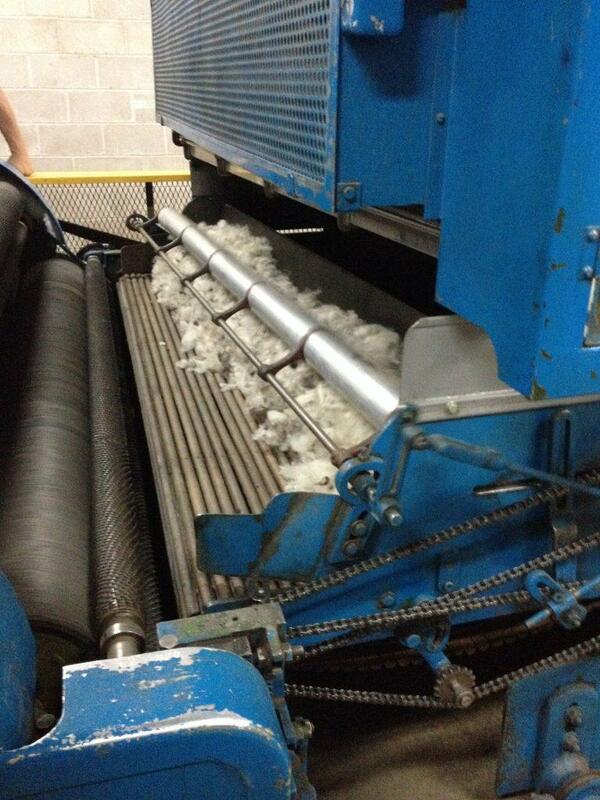 Wool coming off the ladder to go through another series of rollers. 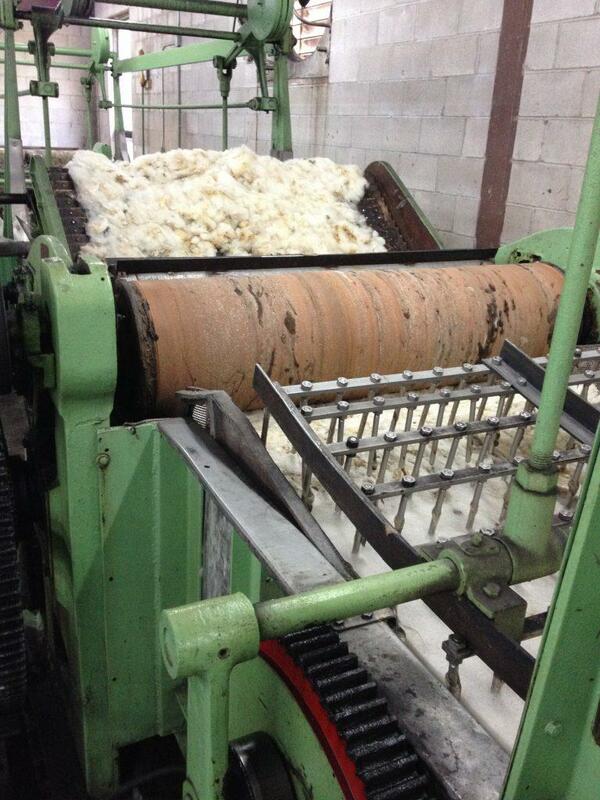 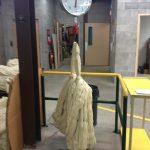 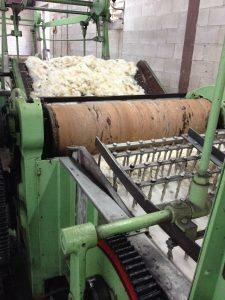 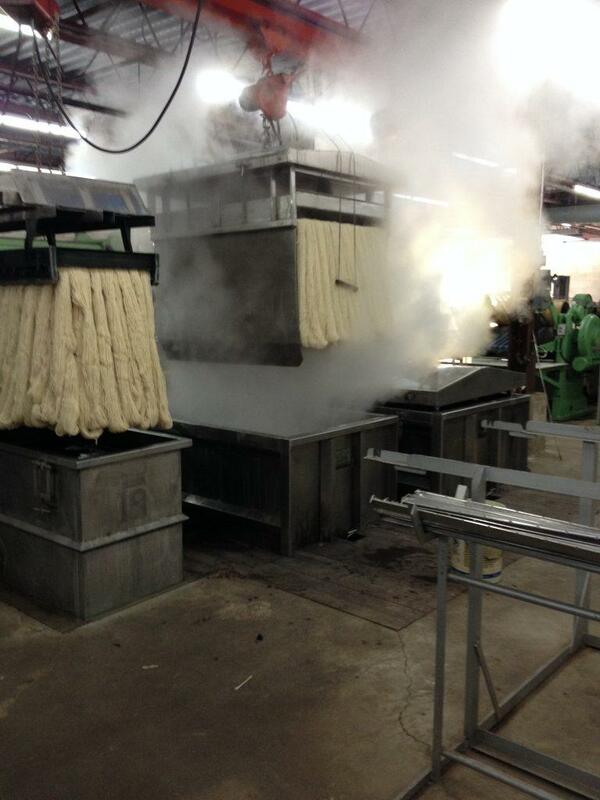 It is here that we take off wool for our carded wool. 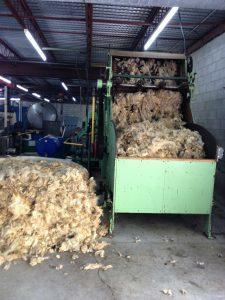 Another view of wool going through the carding machine. 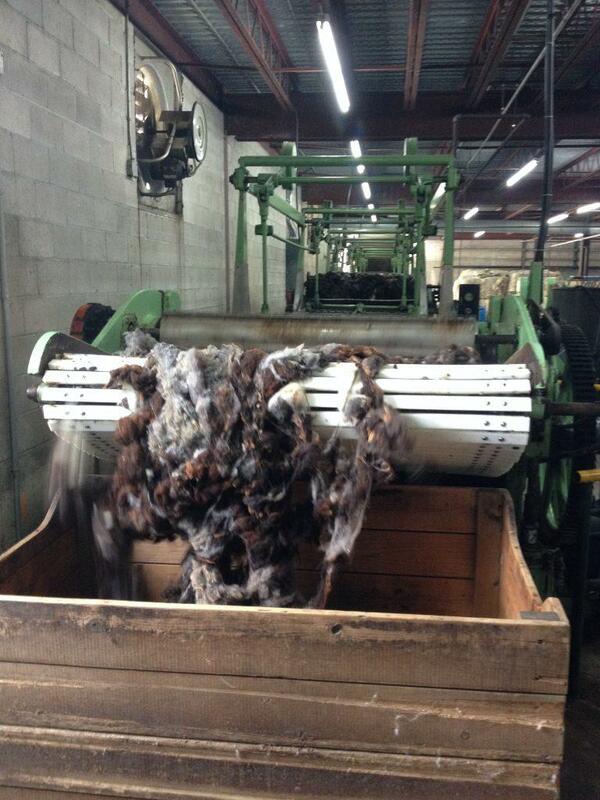 Wool going through the ladder. 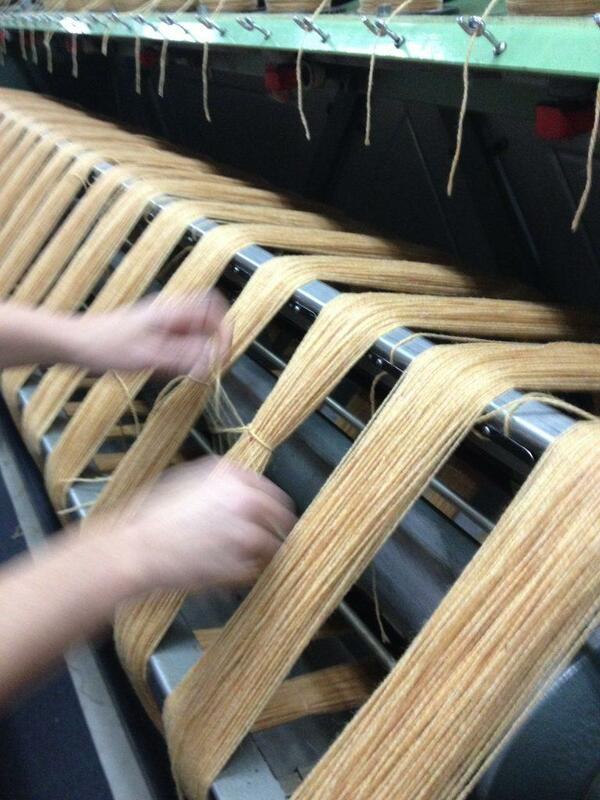 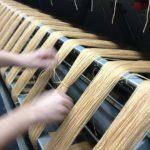 Spinning frames take the primary strands of wool and spin them into a strong, smooth and uniform yarn. It is single ply and can spin to any specification. 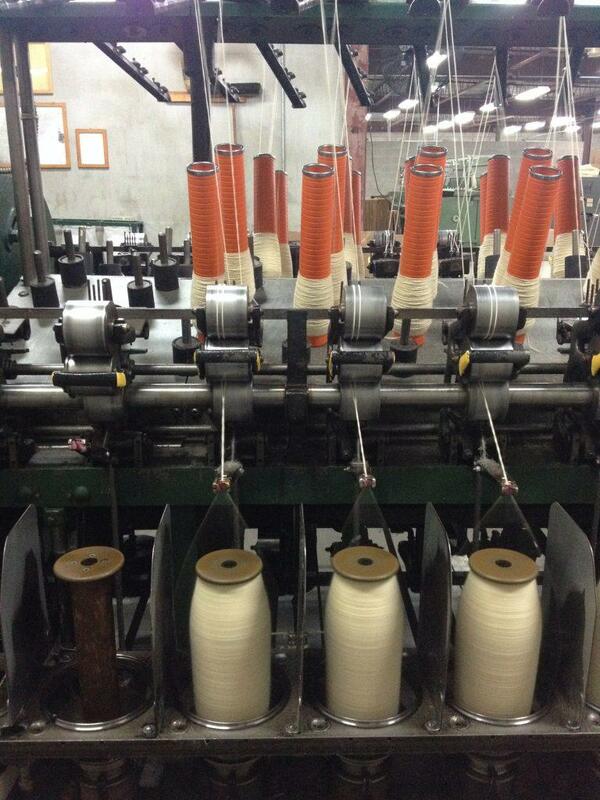 The turning of the bobbins does the main spin. 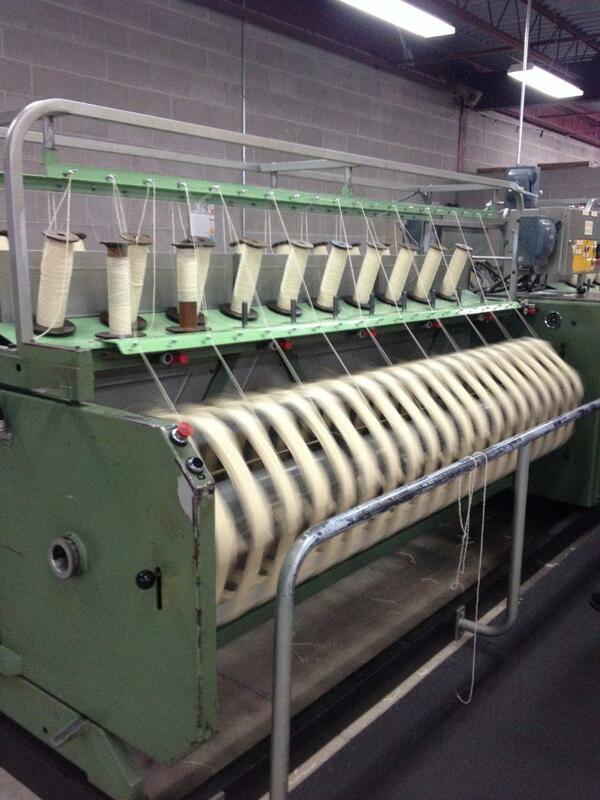 Spinning frames does the same work as the old spinning wheel. 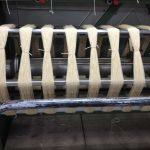 After the yarn is spun it heads for the twister that plies it together. 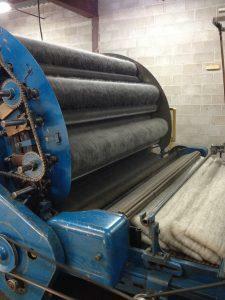 Two ply and three ply are the most common but we can ply up to eight strands. 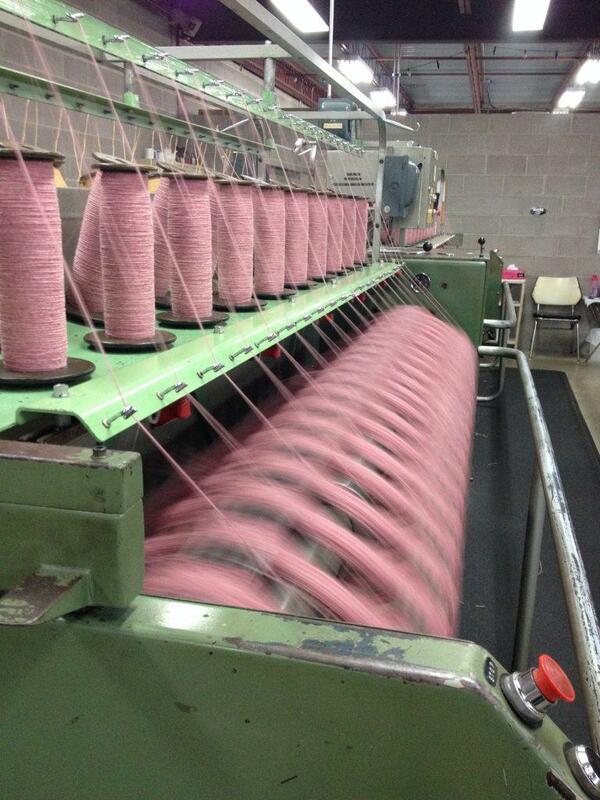 If we spin in one direction we always twist in the opposite direction. 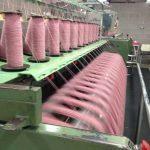 From the twister the plied yarn goes to the reeling machine, which winds the yarn off the twister bobbin onto the reel. 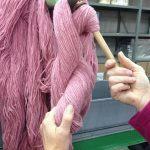 We wind the yarn off until we have a 4 oz. 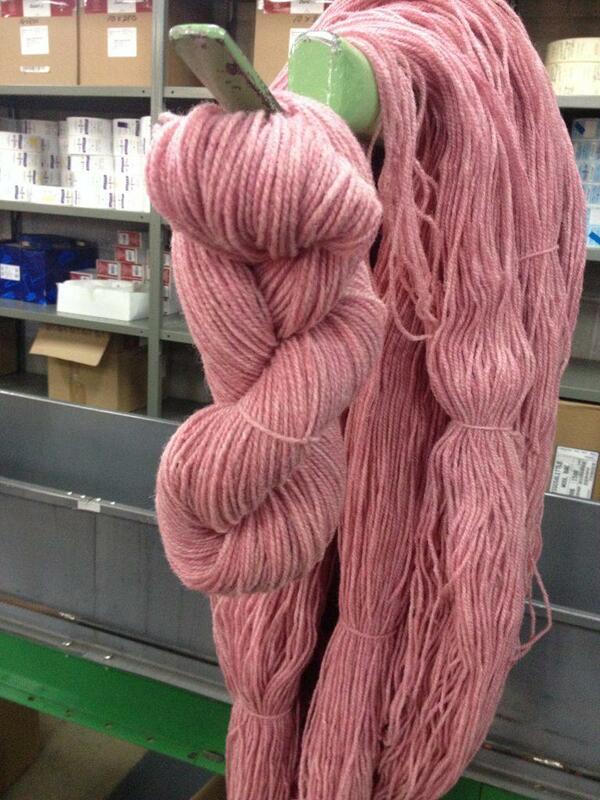 skein or hank. 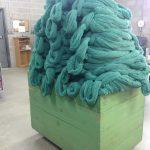 The yarn is cut and each skein is tied three places around itself with the ends tied together. 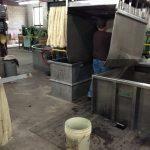 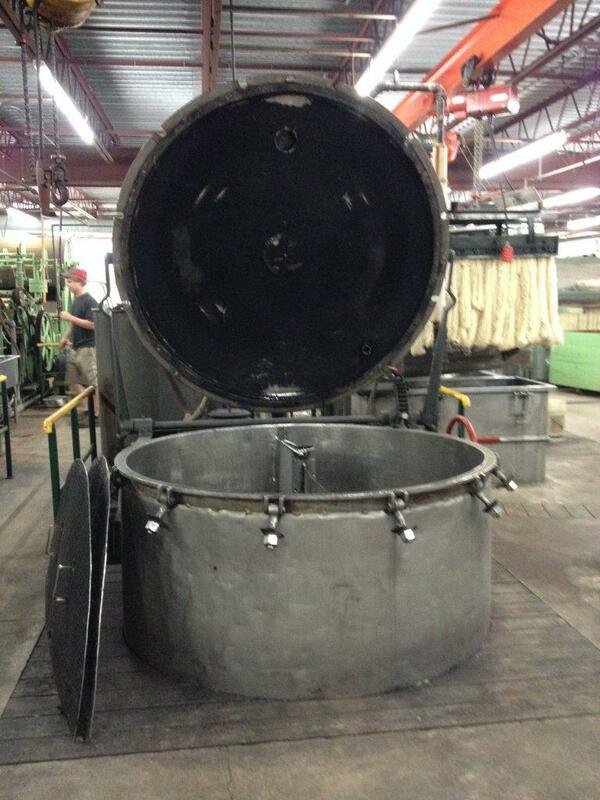 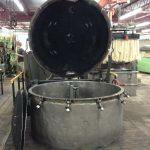 From there is goes to the dye house to be dyed or scoured. 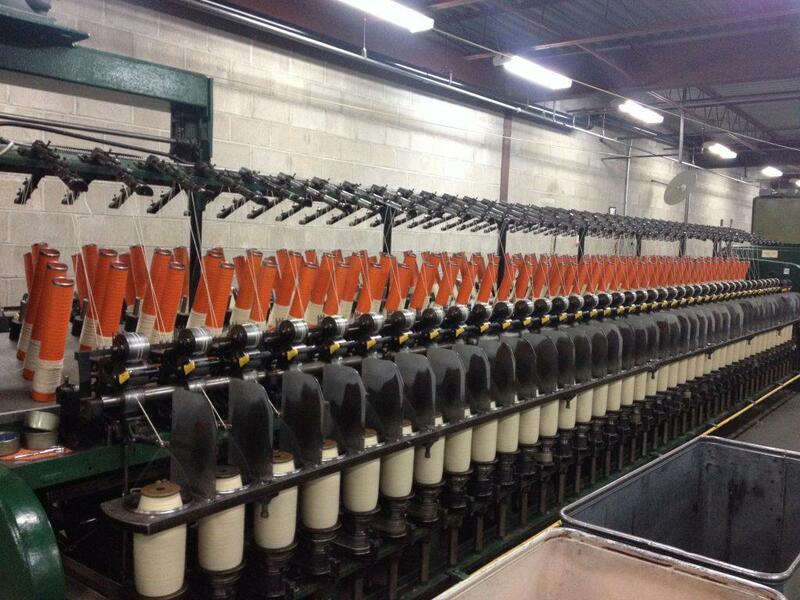 We have a total of 4 in operation at one time with 3 operators monitoring the machine. 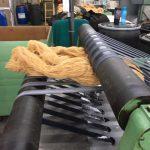 Once the correct amount of turns have been made, the reeler is stopped and the yarn cut and every skein needs to be tied off by hand. 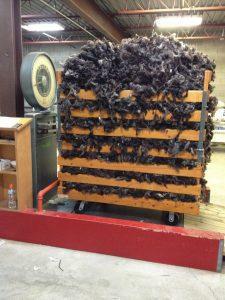 Once taken off the bunches are weighed and ready for the next process. 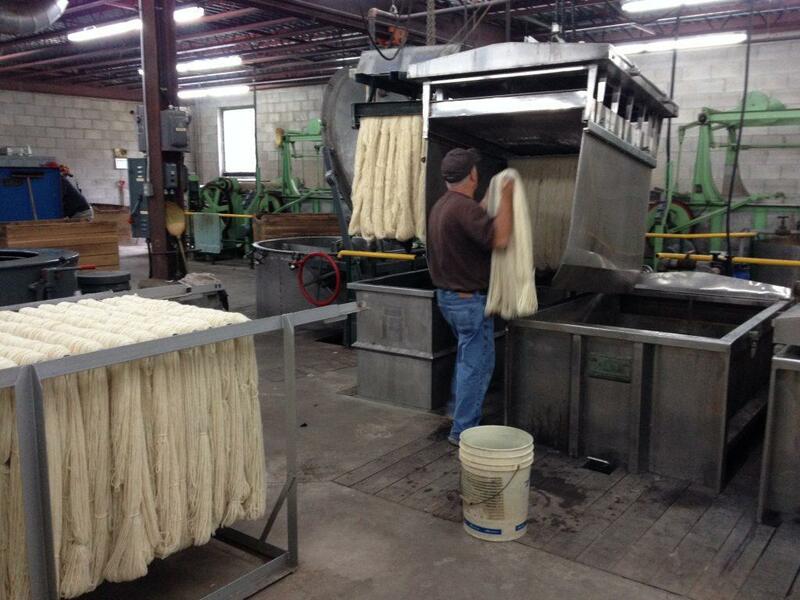 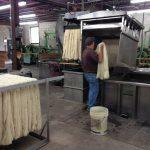 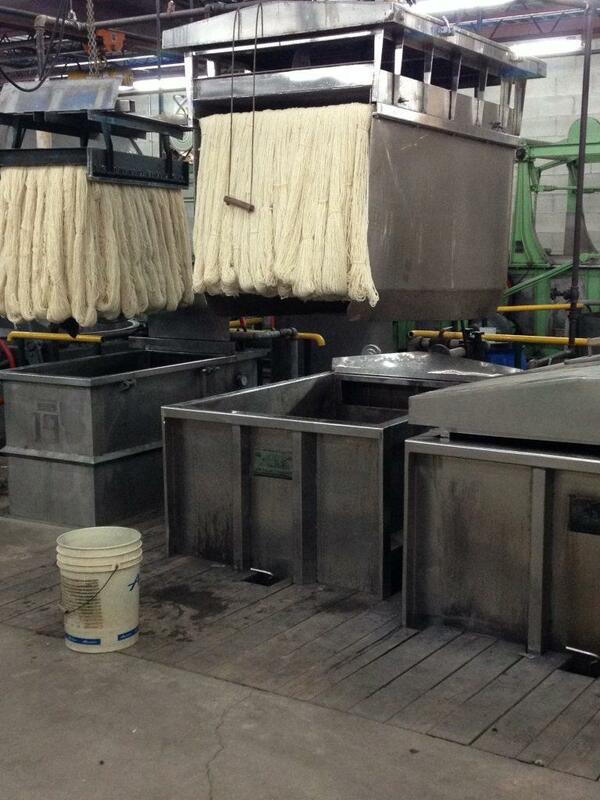 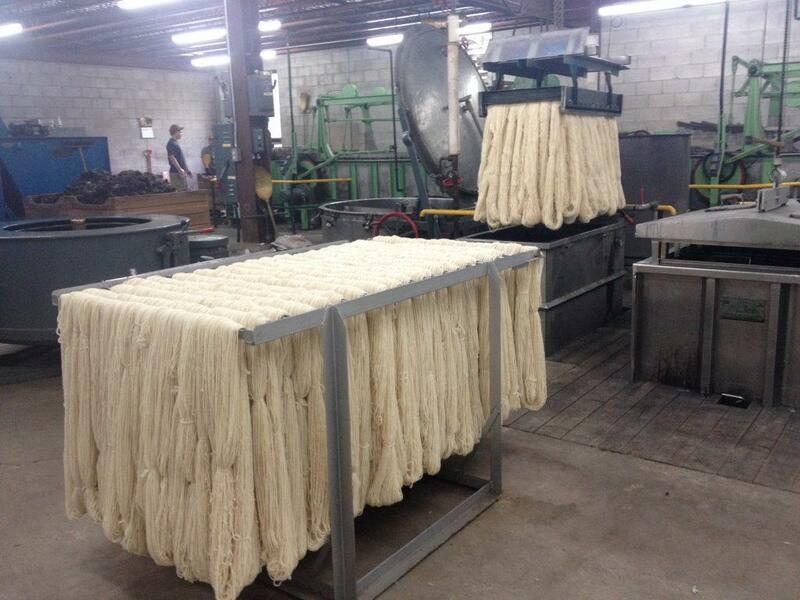 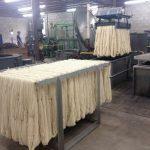 After the wool has been made into yarn it is again washed to remove spinning oils and dirt. 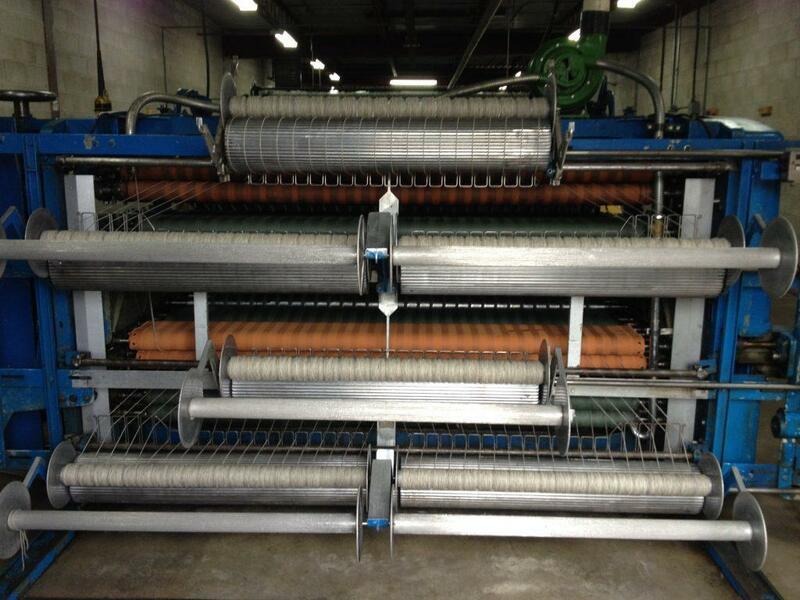 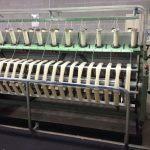 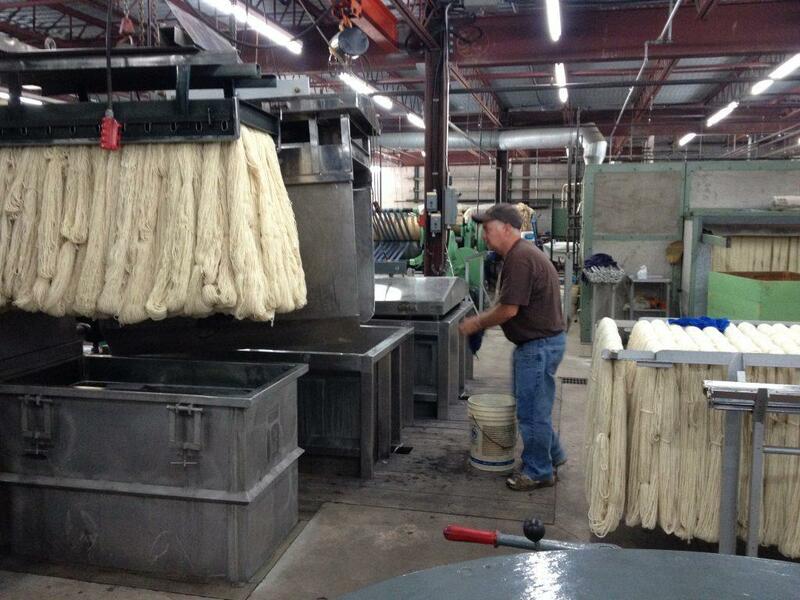 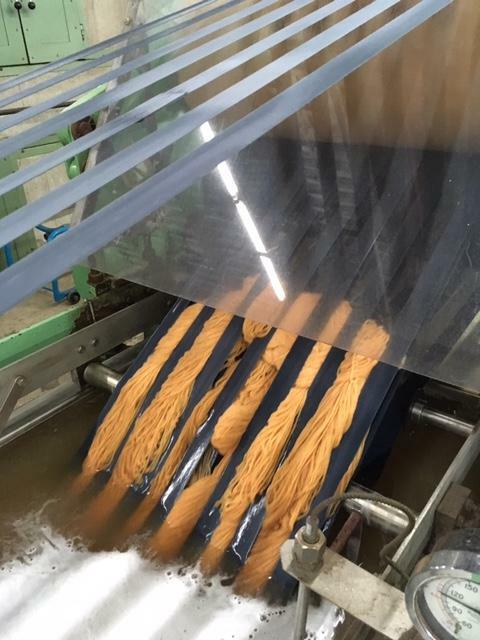 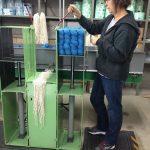 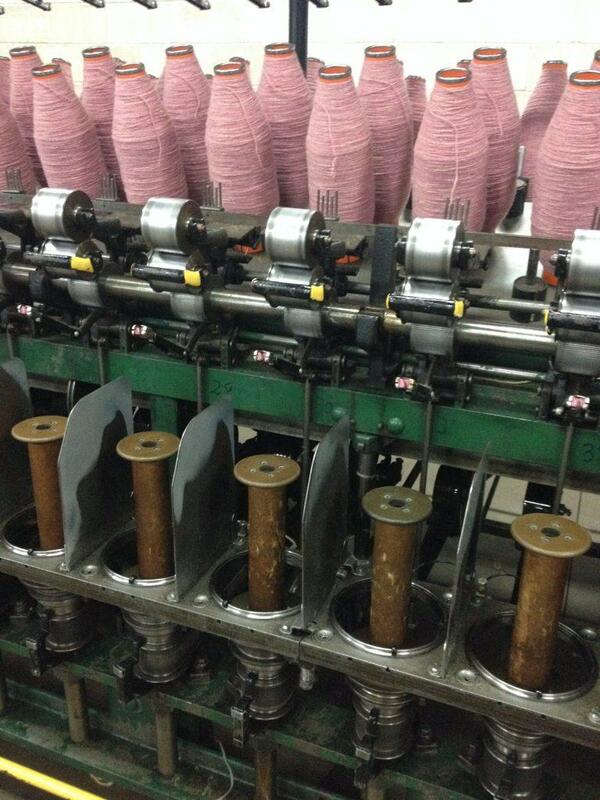 The yarn goes through a series of belts and squeeze rollers in the washing process. 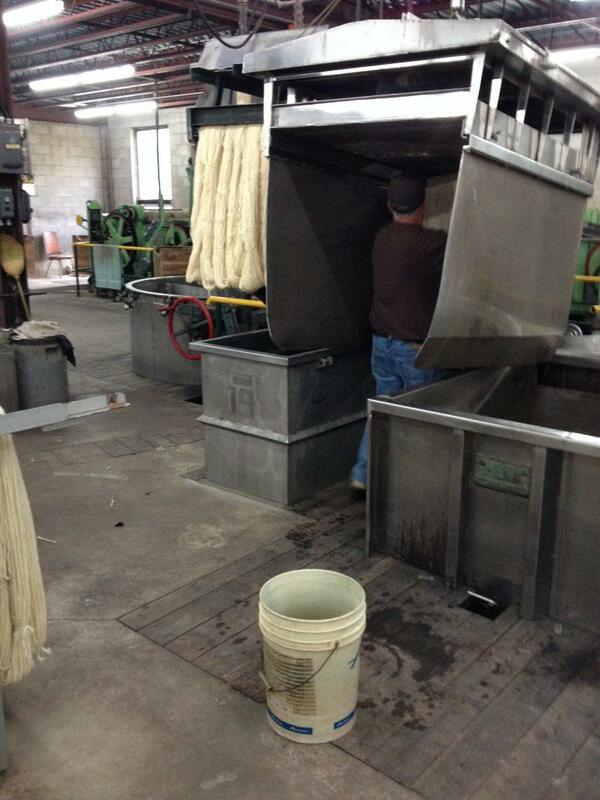 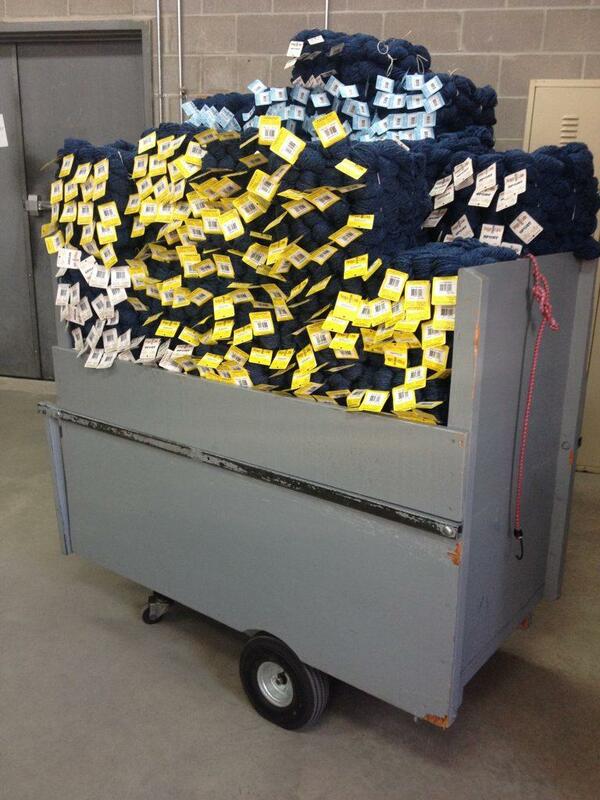 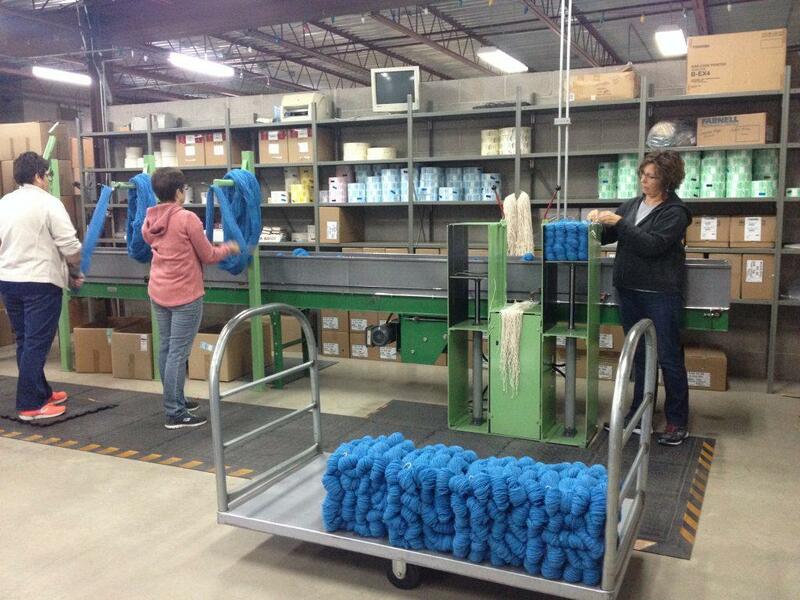 At the end of the washer the yarn is taken out and put in a cart to go to the yarn dryer. 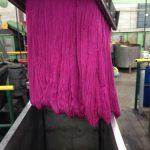 All yarn that has been dyed or scoured is wet. 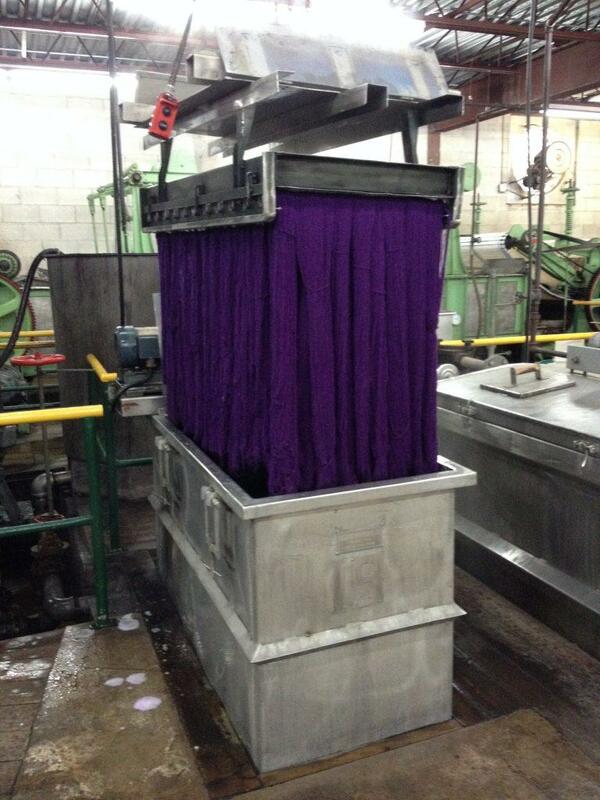 Our dye house is located in the basement. 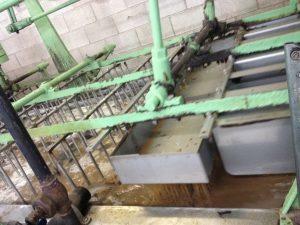 We still use the water from the pond across the road and it is gravity fed into the basement for all our washing & dying needs. 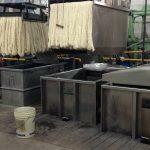 Yarn is hoisted up to allow to drain prior to going into the extractor to be spin the water out. 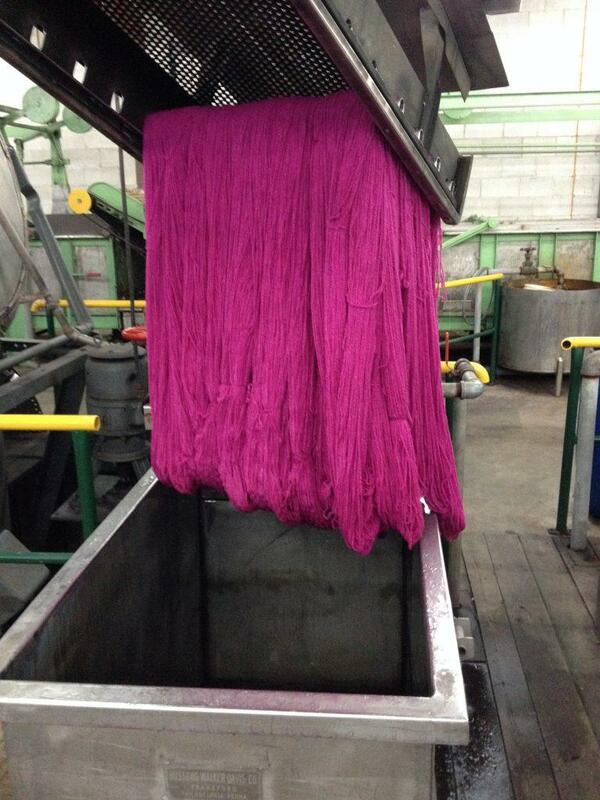 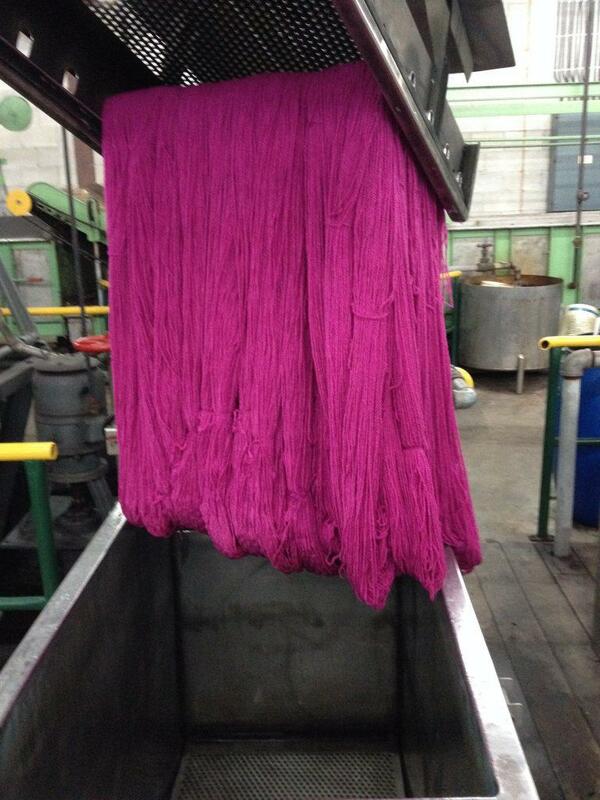 All our beautiful colours are dyed with environmentally friendly dyes to help reduce our carbon footprint. 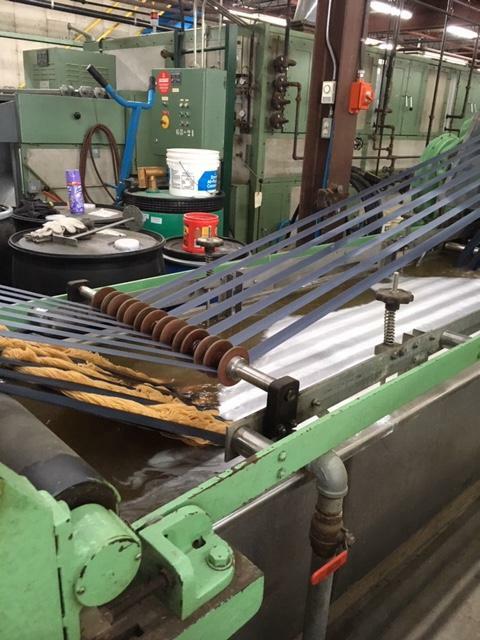 We are unwilling to treat our yarns to the harsh chemicals necessary to burn out all the remaining vegetable matter or to do the super wash treatment. 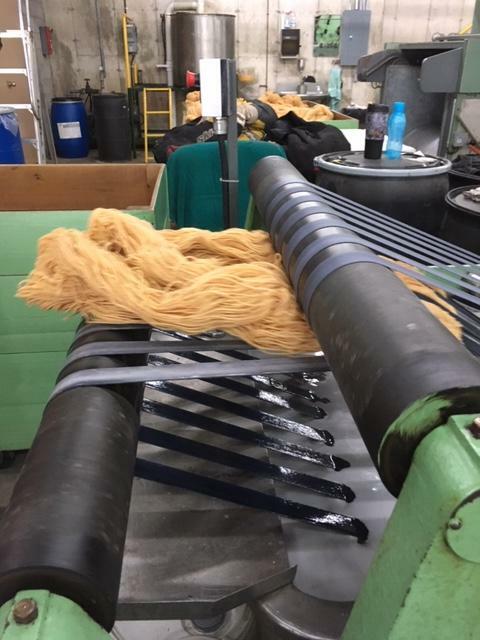 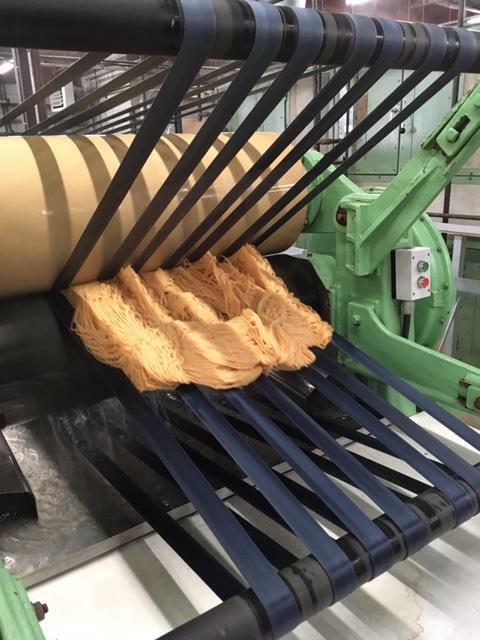 Once the wet yarn has been removed from the extractor it goes to the yarn dryer, where it is hung on the poles and moves through the dryer like on a conveyor. 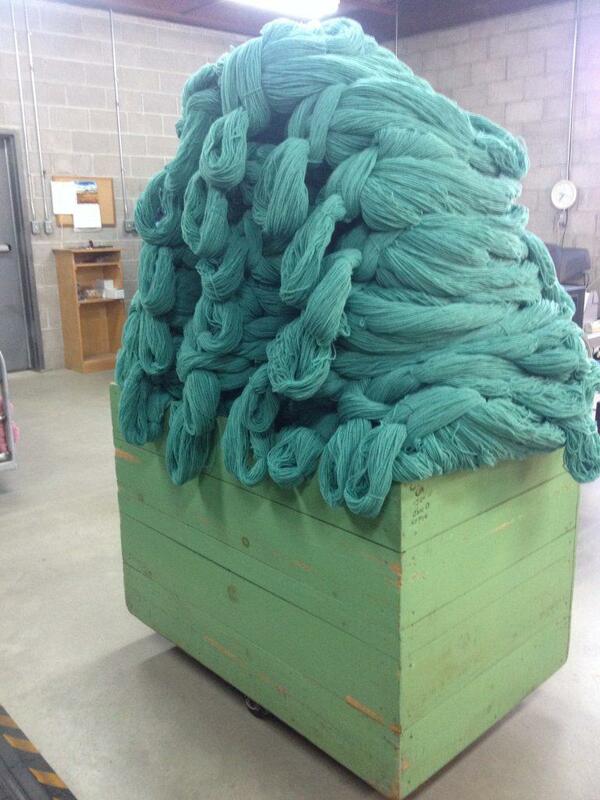 Yarn is all dryed and ready to be removed from the poles, bundled up to go back upstairs to be skeined and tagged for sale. 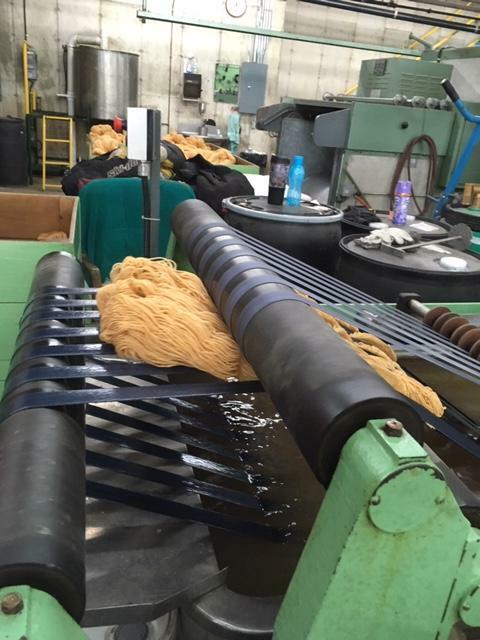 We then load it into the yarn dryer and dry it with a temperature no greater than 150 F.
Skeining & Pressing is the last stop before storage & shipping. 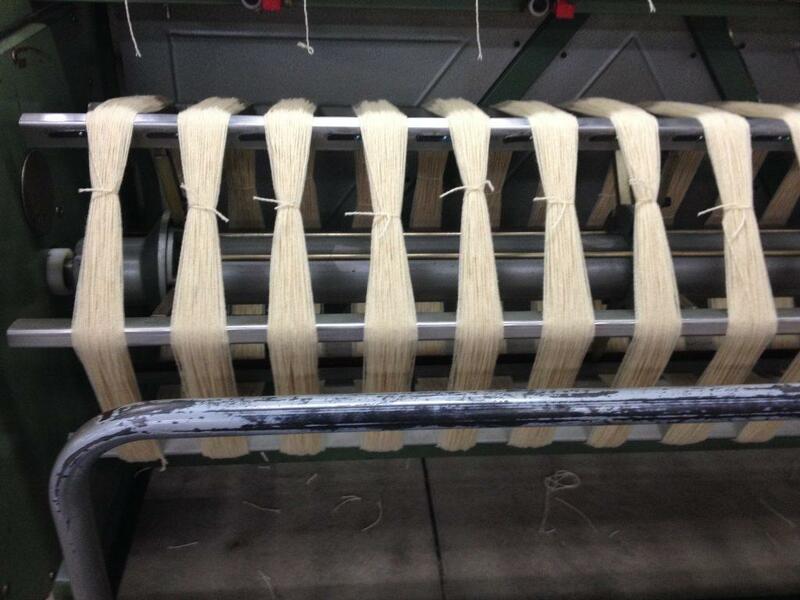 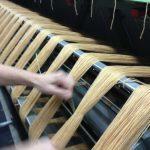 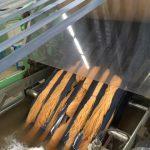 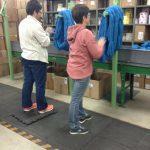 Skeining & pressing is also our quality and control. 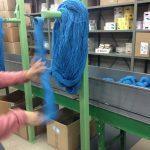 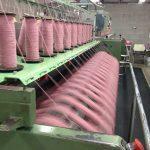 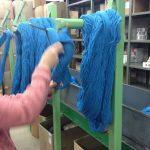 Every skein is inspected prior to being wound into a butterfly skein for irregularities of any kind. 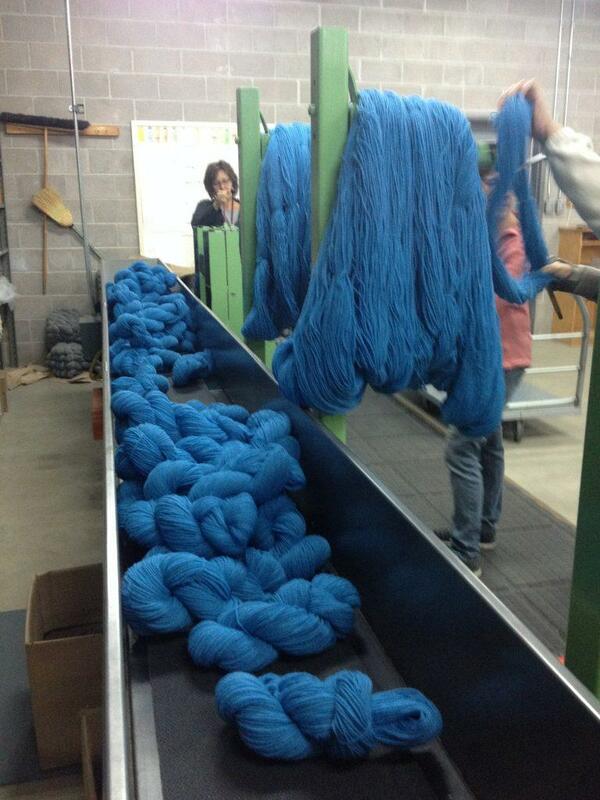 After the skein has been inspected then it is wound into our butterfly skein. 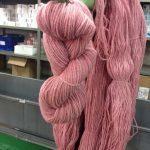 If you wonder why our skeins are done up in butterfly skeins it is create less tension on the yarn. 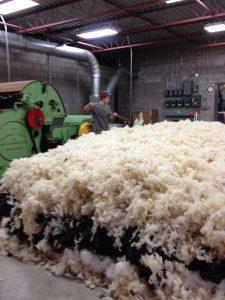 Wool has a memory and it is better for your yarn to be in this relaxed state rather than has tension on it. 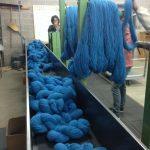 Skeins all lined up and being pressed and tied into bundles ready to be tagged. 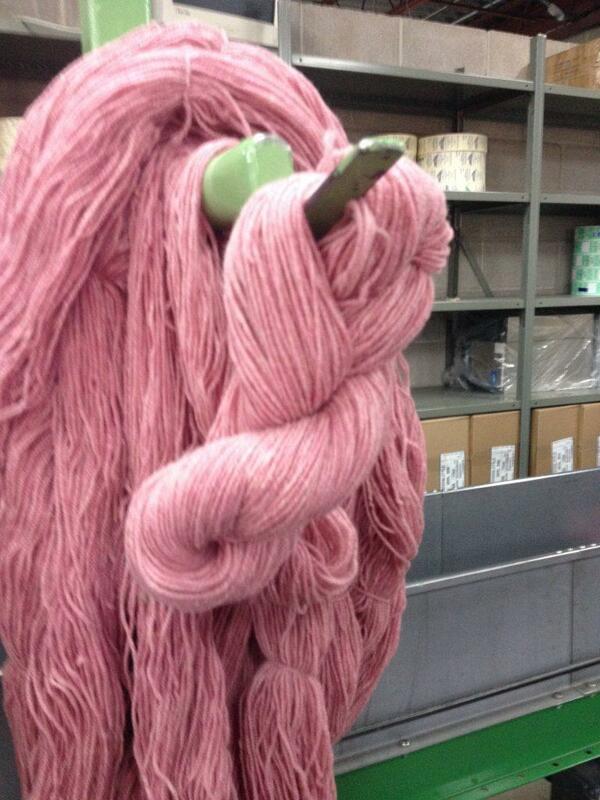 Tagging the yarn. 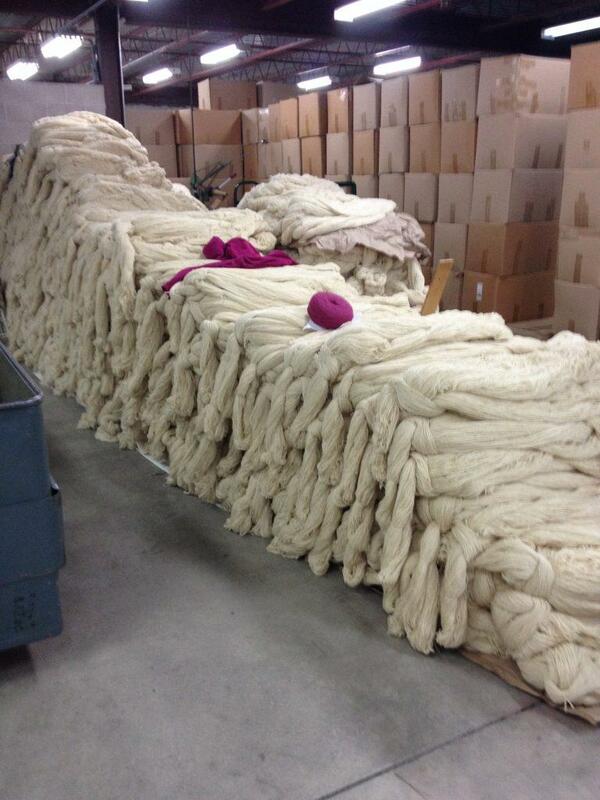 Every batch has a lot #. 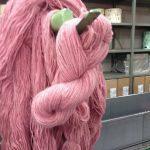 This is very important information to have if you ever run out on a project. 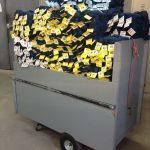 Always keep your tag so we can get you a match to finish your project. 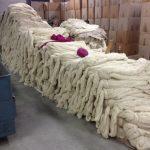 After the skeins have been wound up and pressed into 5lbs(20 skein)bundles, they are tagged and sent to storage & shipping.